Here is a boy with five small barley loaves and two small fish, but how far will they go among so many? (John 6:9). As a boy, my childlike imagination had no trouble believing in the Lord's miracles. In fact, I loved to imagine what it would have been like to have been there and seen them. We are blessed these days with several very good films depicting the life of Christ. They have put depictions of these miracles on the screen for us. Some of these videos are very much like I had imagined. Others, if I am honest, come off pretty cheesy — the whole walking on the water story has never been put on film satisfactorily. A few of these video-presented miracles don't get what my heart saw as a boy when I read the gospel accounts. I love Mark's account of the four friends lowering their paralyzed buddy down through the roof (Mark 2:1-12). These friends had to dig through the mud and leaves on the roof above a packed house listening to Jesus. Sweaty, irritated, and bewildered, people are standing shoulder to shoulder. Without warning, hammering overhead dislodges bits of dirt and leaves, which rains down on the crowd as the paralyzed man's friends finish their hole in the roof. Somewhere along the way, the dimly lit room was flooded with sunlight. Dust particles danced in the air as a shaft of sunlight blazed through the jagged opening. Squinty hurting eyes blinked back to dust as eyes adjusted trying to focus on the crumpled body that was lowered to Jesus. The crowd scrunched back to make room while leaning in to get a better view. They wanted to see a miracle and to hear the Lord's first words. No film has adequately captured the emotion, the drama, and the beauty of this moment, at least not for me. Another miracle has proved very hard to put into a film. I understand the difficulty. Like the filmmakers, I can't get my mind to picture adequately how it happened. More than 5,000 weary and hungry people were scattered across a hillside. The sun was dipping low in the sky. Hungry bellies were beginning to growl. Jesus' apostles were worried. Then Jesus told them to feed the crowd. "Whoa there Jesus," one disciple seems to have been saying, "we can't fix this problem; it is too big." Andrew, who always seemed to be bringing people to Jesus, found a little boy who was willing to share his picnic lunch. Yes, this boy, so much like many little kids, had no sense of the difficulty of the moment or the enormity of the crowd. But he shared what he had: a generous heart and a child-like trust that Jesus could make it work. Here is a boy with five small barley loaves and two small fish, but how far will they go among so many? A little over twenty years ago, I had just finished taking communion on the Sunday after Thanksgiving in 1995. With a touch of impertinent frustration, I asked the Lord, "What in the world am I supposed to do now?" I had all this material I had written for short radio spots. With all the radio mergers, advertising prices had become too expensive. These radio spots had been called HEARTLIGHT. I had begun to think all that work had been wasted. I sat there reminding myself that communion is more about resurrection than crucifixion. After all, we take on the day Jesus was raised and not the day he died. With my impertinent question stuck somewhere between my pew and heaven, the Lord surprised me. He did something I didn't expect. The Lord spoke to my heart. At least, I guess that's what I'd call it. I didn't hear a voice, but my heart very clearly heard an answer: "The internet, dummy!" 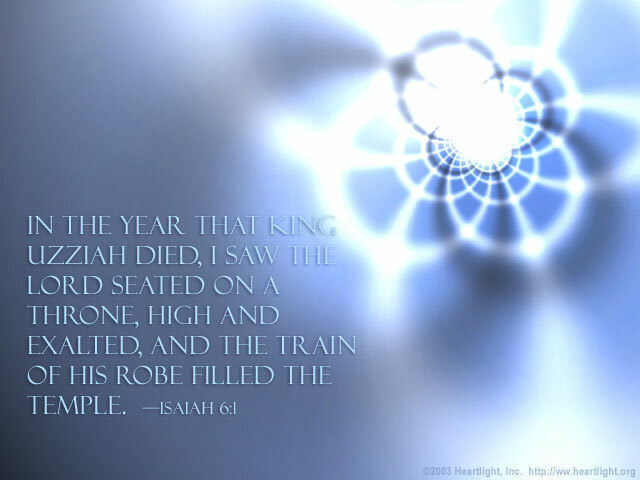 Isaiah had an overwhelming experience of God when he was called (Isaiah 6:1-8). Appropriately, I guess, what I received was, "The internet, dummy!" My heart heard this call from God twice. There was no mistaking the message. My answer was similar to Isaiah's: "Here I am. Send me!" Of course, I didn't have any idea what that commitment meant. Of course, twenty years ago, most folks had no idea what the internet was going to be. I went to the high-tech folks in my congregation and shared this idea. Many were excited. Few knew what to do with the excitement. Then by the grace of God, I asked to see a video done for some of our folks who had come back from a mission trip to Guyana. I felt it was too long to show in worship, so I asked to see the video for myself. A young guy freelancing as a graphics artist invited me to his makeshift studio to watch that video. I don't remember anything about it other than the graphic artist who did it: Paul Lee. The Lord put us together, and we launched Heartlight.org a few months later in April of 1996. The Lord has led our small Heartlight.org team on an amazing journey these last twenty years. Paul Lee has moved on to other things. Ben Steed, who sold us the website verseoftheday.com so that he could complete his vocational ministry and business degree, is now my junior partner many years later. Ben has just completed our site redesign, and he is the major "behind the scenes" guy that handles a wide variety of things that keep Heartlight.org, verseoftheday.com, and aYearwithJesus.com all working. To our amazement, Jesus has multiplied our loaves and fishes into a ministry that reaches hundreds of thousands of different people each day — a half a million or more each month across 175 or more countries in 11 languages. When we began, not one of us had such grand expectations. We wanted to help a few missionaries and believers struggling to find resources for new Christians. We couldn't imagine that our meager efforts would make much of a dent in the huge needs of the people we wanted to help. Our expectations for our small resources were similar to Andrew's: "[H]ow far will they go among so many?" Repeatedly, through the grace of the Lord and nudges from the Holy Spirit, we have stumbled our way into the things the Lord had prepared for us to do (Ephesians 2:10). I couldn't imagine how Jesus fed the 5,000, and here the Lord was using our small resources and meager output to touch thousands of people each day. To our joyful amazement, the Lord has proved again and again that he can "do immeasurably more than all we ask or imagine, according to his power that is at work within us" (Ephesians 3:20). So "to him be glory in the church and in Christ Jesus throughout all generations, forever and ever! Amen" (Ephesians 3:21). In addition, I kept hearing from others how Heartlight.org was a friend that dug holes through the roof of people's darkness and brought them light, healing, and comfort from Jesus. In our earliest days, I heard from a missionary in the Philippines who used the resources with businessmen at an internet bar to lead a Bible study each week. I wept for joy as I learned of three Hawaiian teenagers who had subscribed to Today's Verse. They came to the conclusion they needed to be baptized. So they went to the end of the road on the west side of Kauai and baptized each other into Jesus, confessing Christ as their Lord and Savior as they shared in the death, burial, and resurrection of the Lord. I wept with a profound sense of thanksgiving and sadness when I received an email from the husband of a lady who had bone cancer. She had used our resources as her tie to the Christian community and to Jesus. We were there during the hard nights of her painful struggle. When she passed from this life, she had Today's Verse from Heartlight on her laptop screen. I could share similar stories for hours upon hours. Words cannot capture the emotion we feel at hearing them from people overjoyed to share them with us. Yes, we are truly thankful to the Lord for our journey. We are full of joy at turning twenty years old this month. Twenty is a lot of years to be have been on the internet as a non-profit. Twenty years have meant many late nights. Some years were very tight financially. Some years we operated six servers out of a study in my house. During one of those years, my junior Heartlight partner, Ben, slept in that study while interning with us. With twenty-seven led lights blinking at night, he didn't need to turn on the light to read his Bible at night. When he got married at the end of the summer, he had to get a fan while on his honeymoon so he could sleep because he was so used to sleeping while hearing the exhaust fans on the computers. All of which reminds me of the best part of these twenty years. It's the times spent with people developing and deepening relationships. We have so many friends, most of whom we have never seen face-to-face and likely won't see this side of glory. But, one of these days, we will share the table of the Lord at the great reunion of God's people when Jesus' return. Oh, my! That will be a sweet, sweet reunion. I couldn't imagine how Jesus fed the 5,000, and here the Lord was using our small resources to touch thousands. Thank you for including us in your spiritual journey. Thank you for those notes of encouragement and appreciation. Thank you for the hundreds who have contributed articles over the last twenty years. The gifts of your ideas, faith, and encouragement have kept us going through some hard times. Thank you especially to the folks who have been partners on this journey — my precious wife and Heartlight partner Donna Ware, my original partner Paul Lee, our go to geek and friend John Kirkland, my partner and developer Ben Steed, the crazy Italian buddy Roberto Gilleni, my fishing buddy Dan Garrett, my long-time friend David Culp, my buddy headed to Thailand with me Barry Alexander, our Portuguese developer and missions partner Dennis Downing, our donations support partner Diane Minatra, and early supporter and encouragement Gary Skidmore. Thank you to our translators (whose last names we can't share because several live in places hostile to Christians): Phyllis, Olexandr, Anchalee, William, Karen, Kitty, Roufi, Miriam, Sara, and Diego. Thank you to our proofreaders and editors, Ray Butts and Ed Holley for making everything better because of your attention to detail. Most of all, thank you, Jesus! Thank you, Lord, for still doing miracles little boys can't quite figure out how you do. Thank you for keeping alive the little boy inside this growing older man who marvels that you would let him experience a grace too big to imagine, yet so wonderful to experience. Thank you, Lord, for twenty! We couldn't have done it ourselves. The glory, O Lord, is yours alone! "TWENTY!" by Phil Ware is licensed under a Creative Commons License. Heartlight encourages you to share this material with others in church bulletins, personal emails, and other non-commercial uses. Please see our Usage Guidelines for more information.